They say it's not the size of the dog in the fight... and they'd be right. This video shows how it's all about how much fight is in the dog, as a teeny-tiny canine takes on a much bigger rival in a battle for the food bowl. The pair are seen at loggerheads over a bowl of food, but despite his considerable size advantage he doesn't seem to be getting any change from his adversary and is going hungry as a result. Fortunately the whole hilarious episode has been caught on camera and uploaded online for all to see. The clip has proved a roaring success online with over half a million people tuning in in the last week. 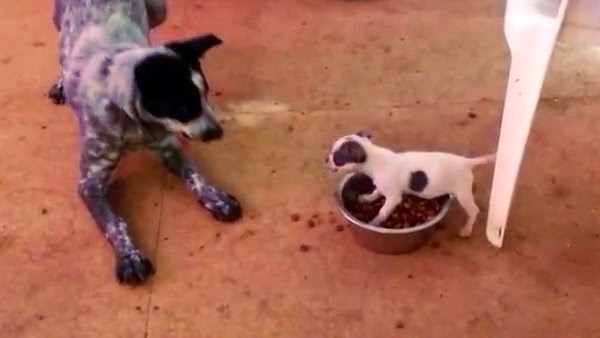 Responses to "Tiny dog takes on giant rival in food bowl battle and you'll never guess who wins (Video)"
I had kittens that were that way about food or meat when they first got it. Was hillarious.